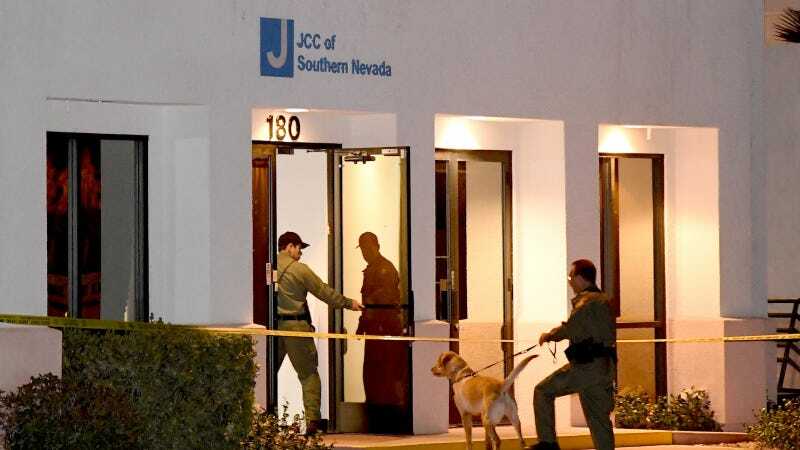 Las Vegas Metropolitan Police Department K-9 officers search the Jewish Community Center of Southern Nevada after an employee received a suspicious phone call that led about 10 people to evacuate the building on February 27, 2017 in Las Vegas, Nevada. Image via Getty. Israeli authorities have arrested a 19-year-old US-Israeli dual citizen on suspicion for calling in bomb threats to Jewish Community Centers around the world. Police Spokesman Mickey Rosenfeld told the Jerusalem Post that the teen “was the main suspect” for threats made to centers in Europe, Australia, New Zealand, and the US. “The investigation began in several countries at the same time, in which dozens of threatening calls were received at public places, events, synagogues and community buildings that caused panic and disrupted events and activities in various organizations,” said Israeli police said in a statement. However, police have not released any information surrounding the suspect’s motives. It is also unknown, at this point, whether he was a lone operator or worked with a team of people. Police have also detained and questioned the suspect’s father to ask him about the son’s technology, which included a “large antennae and other unusual hardware,” according to the Post. According to the Times, the investigation is separate from the case of Juan Thomas, a former journalist in St. Louis who was arrested in February for allegedly threatened several Jewish community centers. “As part of the ongoing investigation, we are trying to see if and how he was connected to the different Jewish communities in the US. That directs the investigation to the American connection. We are looking to see if there was an incident which triggered him to carry out threatening those communities,” Rosenfeld told the Post.